ASBURY PARK – Announced earlier this year, the Makin Waves 30th Anniversary Party has added three more special components to the all-day festival on March 31 at the Wonder Bar, 1213 Ocean Ave.
To close the 2 p.m. to 2 a.m. event celebrating the award-winning music column, Upstage legend Paul Whistler will lead an all-star jam with a variety of invited musicians who frequented the fabled coffeehouse where so many Asbury Park musicians cut their teeth. Confirmed to perform are original E Street Band drummer Vini Lopez, singer-songwriter-guitarist Joe Petillo, guitarist Billy Ryan, keyboardist John Mulrenan and more to be announced soon. The previous Upstage Jam at the 2017 Asbury Park Music in Film Festival was a star-studded event, remembers Whistler, who rose to local fame with the Wheels throughout the 1970s. Asbury faves Deal Casino and the up-and-coming act LEEDS will join the Jersey Shore’s first-ever country duo Williams Honor, popular hard rockers Colossal Street Jam, well-rooted punk band The Vansaders, buzzing twin duo Nalani & Sarina, singer-songwriter Karen Mansfield and more. “We are excited to perform for Bob Makin who’s given so much to the NJ music community over the years,” Deal Casino said. Produced by Makin, the Makin Waves music column has covered the New Jersey music scene like a blanket since its formation in East Coast Rocker in 1988. Now published in New Jersey Stage, NJArts.net and back in The Aquarian Weekly for the first time since 1995, Makin Waves has featured all of the anniversary party’s participating artists. They also include Sutton Thomas, Well of Souls great Tom Kanach’s new band The WaterMakers, Mike Brody vs. the People, and Mike Daly & the Planets. The party will be emceed and feature classic Asbury and Jersey tunes spun by “Radio Jersey” Founder DJ Lee Mrowicki, who helped give Makin his start covering the historic Stone Pony in the early ’80s and now presents his weekly “Makin Waves Report” on “Radio Jersey” at event co-sponsor AsburyMusic.com. With the new additions, the show now represents a healthy history not only of Makin Waves, but the Asbury Park music scene, Makin said. These prizes include gorgeous canvas-framed covers of The Aquarian and East Coast Rocker featuring Jersey greats Brue Springsteen, Bon Jovi, The Misfits and more; Bruce Springsteen’s new Capitol Theatre CD and a framed poster from that historic 1978 run from Makin Waves and Asbury Park Music Foundation; more framed posters of historic early Springsteen Asbury shows from the Foundation; a signed book and T-shirt from famed photographer Danny Clinch and his Transparent Gallery; a signed book and a print Debra L. Rothenberg Photography; gifts from the Wonder Bar, Stone Pony, Brew TEA Spot, and WRAT 95.9 the Rat; , and gift certificates from Fat Rat Press, Silverball Museum Arcade, Bubbakoo’s Burritos, and Cookman Creamery. Event highlights also will include drink specials, a free commemorative sheet cake created by event co-sponsor Confections of a Rock$tar and a free commemorative sticker from Fat Rat Press. The event’s first 100 patrons also will receive a free commemorative T-shirt also from Fat Rat. Tickets to the Makin Waves anniversary party are $15 in advance at the Stone Pony box office and via Ticketmaster (plus tax and surcharge) at https://goo.gl/hzsoaS, and $20 at the door. From each paid admission, $2 each will go to Asbury Park Music Foundation and Boys & Girls Club of Monmouth County, both of which provide local at-risk youth with music mentorship. The anniversary party continues a tradition of fundraising for Makin Waves, which has helped raise $132,000 for charity throughout its 30 years, including Light of Day Foundation, United Way, Coalition for the Homeless, Elijah’s Promise, Embrace Kids Foundation and more. 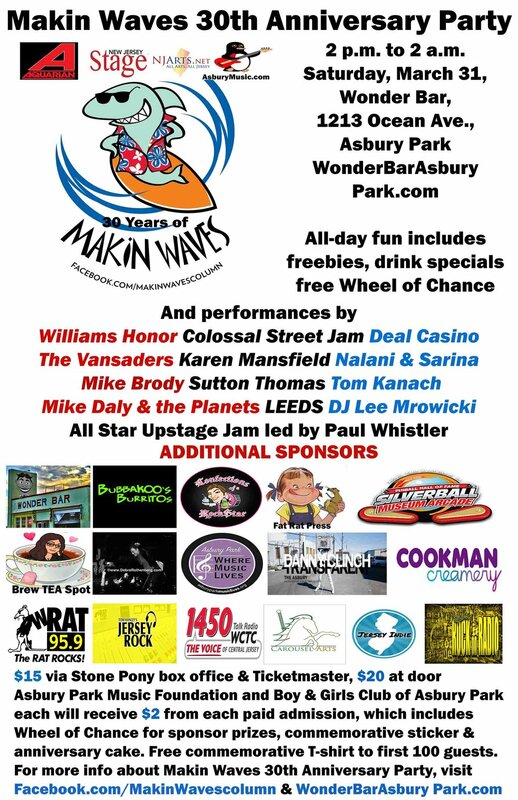 In addition to Makin Waves’ outlets – The Aquarian Weekly, New Jersey Stage, NJArts.net, and AsburyMusic.com – media sponsors include 95.9 the Rat and its “Jersey Rock” show dedicated to local talent; their Beasley Broadcast Group sister station 1450 WCTC AM; radio and web talk-show host Danny Coleman; Carousel Arts, producers of the “OneMore with Brian Erickson” web show, and Jersey Indie, a website supportive to the local music scene. The party concludes an anniversary concert series and is part of the 2018 Makin Waves Concert Series, which launched on Feb. 3 with the sold-out Blood & Roses: The Court Tavern Memorial Tribute to Pat DiNizio and will continue with Hub City Music Festival throughout April in New Brunswick, the Second Annual Makin Waves Jam N Groove Fest on May 12 at Roxy & Dukes, the Makin Waves Summer Concert Series at Asbury Park Brewery on June 30, July 14, July 28, and Aug. 11, ROCK New Brunswick on Sept. 8 in Boyd Park and more to be announced. For more information about Makin Waves, visit www.facebook.com/makinwavescolumn. For more about the anniversary party, visit www.facebook.com/events/148518945869492/ and www.WonderBarAsburyPark.com.